“As history plays out on the land, it leaves its mark. Sometimes the land remains relatively unchanged from generation to generation, but more often, changes accumulate in layers. In areas of extensive human activity the landscape often appears as a patchwork, with elements of older layers “poking through” newer layers, and surviving side-by-side with the elements of the newer layers. A useful analogy is that of the palimpsest, from a Greek word meaning “scraped or rubbed again.” A palimpsest is a writing material such as parchment from which writing has been partly or completely erased to make room for another text. Older writing can often be discerned under the newer writing. Landscape change occurs in a similar way with elements of past landscapes visible amidst more recent additions.” Quote from “Guidelines for Documenting and Evaluating Historic Military Landscapes: An Integrated Landscape Approach”, by Suzanne Loechl, Samuel Batzli and Susan Enscore. 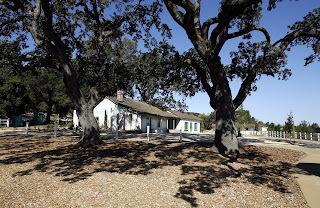 The Francisco Alviso Adobe site in Pleasanton, California is a palimpsest with three eras of history. If you visit the park today you will see a Native American rock feature - similar to a grinding stone - that was used in ceremonies by the native people. You can tour the now restored Alviso Adobe, from the early Californio period – when California was still owned by Mexico. From 1898 to 1917 the Kroeger family, tenant farmers, lived in the adobe. All photos used in this post were provided by the City of Pleasanton. 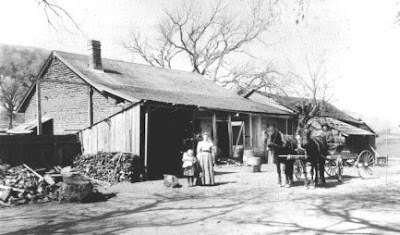 This photo shows the Kroeger family in front of the adobe. The park includes a reconstructed milking barn from the Meadowlark Dairy era. Meadowlark started in 1919, and was known for producing the highest quality milk available until it was closed in 1966. The barn and all the associated dairy buildings were demolished in 1968. In 1995, my firm, PGAdesign was invited to work with the residents of Pleasanton to develop a master plan for the 7-acre Alviso Adobe Community Park. During community meetings discussion focused on which historic period to feature. Fortunately, the decision was to include them all. 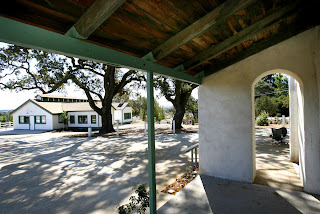 The extant adobe – built in 1854 was an obvious choice, and the addition of the milking barn created a new community space for events and performances. This is an excellent example of how history is not always simple and neat. Typically, history is multi-layered with interwoven relationships, and while interpreting these sites is challenging the result is more dynamic. PGA retained Dan Quan to design the interpretive exhibits. Dan collaborated with Pleasanton staff and residents – some of whom had worked in the dairy, and their stories bring life to the exhibits. Alviso Adobe Community Park is a perfect day trip for Bay Area residents. Plan a picnic in the park followed by a hike on Pleasanton Ridge. But, this is not a HALS site. One of the criteria for HALS is that the landscape features must have historic integrity. The California Register of Historical Resources defines integrity as "the authenticity of an historical resource's physical identity evidenced by the survival of characteristics that existed during the resource's period of significance." Other than several large native oak trees, little of the historic landscape remains from the Alviso era, and archaeologists were unable to find any significant features from the Meadowlark Dairy era. This site may not qualify for HALS documentation, but the adobe is a State Landmark No. 510 - that, the interpretive exhibits, and beautiful site make this park well worth visiting. I've been interested in family history research since the Mormon Temple opened in Oakland in 1963. During a tour of the new campus I caught the genealogy bug. I joined the California Genealogy Society in 2004. I have done a lot of research and collected information from family members. Check out my family history blog at: http://pattillothornally.blogspot.com/ During this trip I plan to visit places where my ancestors lived and died. I want to see the places they lived and worked. I also plan to do research at local repositories and will share what I find. Along the way I will be visiting several state and national parks. The 2013 HALS Challenge is to document a landscape designed by a woman. Link to PGAdesign Landscape Architects where under the historic preservation tab you can read about HALS documentation and other cultural landscape services provided by our firm. My objective is to pique your interest in historic landscapes, to entice you to visit some of the sites I will write about, and possibly change how you view the California landscape. I am a Landscape Architect by profession and passion and I know that for many people landscapes are essentially invisible. In recent months I have been visiting historic sites for the Historic American Landscapes Survey (HALS) and doing research on these places, and the people they are associated with. So far I have visited 50+ sites. In each case the process of visiting the site with purpose and doing research has enhanced my experience. The HALS program is administered by the National Park Service who also oversees two companion programs – HABS the Historic American Building Survey and HAER Historic American Engineering Record. This blog will feature these places and HALS. My intent is to be entertaining and informative. If you are interested in learning more about HALS you should visit the Northern California HALS website . There you will find more information about HALS, a mission statement, a list of potential HALS sites in Northern California, answers to frequently asked questions, and many links to related subjects. Three Yew Trees (Taxus baccata) flank the monument to Frank Norris author of The Octopus and McTeague. 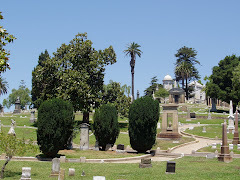 This grave and these trees can be found at Mountain View Cemetery in Oakland, California at 5000 Piedmont Avenue. Trained docents lead history tours the second Saturday of every month and special tours the fourth Saturday. Tours begin at 10:00 AM. To take a self-guided tour and learn about the trees of Mountain View download Trees of Mountain View Cemetery - A Self-Guided Tour.